Discussion in 'Extended Range Guitars' started by mphsc, Apr 1, 2016. I've had plenty of time to figure out what I like and I think it's come down to my KxK's, the FF8 ViK my SiC FF9 take the cake. All for different reasons but the build quality is insane. Lack of pics due to overzealous playtime..
mountainjam, TheHandOfStone, MAJ Meadows SF and 20 others like this. HNGD! That is a beautiful guitar. I love the top. Congrats! Can you run the bridge pickups on both, through some amp sims, both clean and dirty? I'm interested to hear how the slanted/straight pickups compare to each other. No recording equip, if I can get it done at rehearsal one evening I'll post it up. I can tell you the BKP sound great and really full, more beefy than the KxK's but then again, they're Bare Knuckles. You do loose some clarity that the KxK's seem to retain and the KxK's are articulate across the spectrum. It's not apples to apples either. Love it! Bummer that it's not your custom, but that's a pretty killer one too! What's the scale on that baby? These photos look familiar...did you post this thread a couple months ago? Either way, grats on the axe. 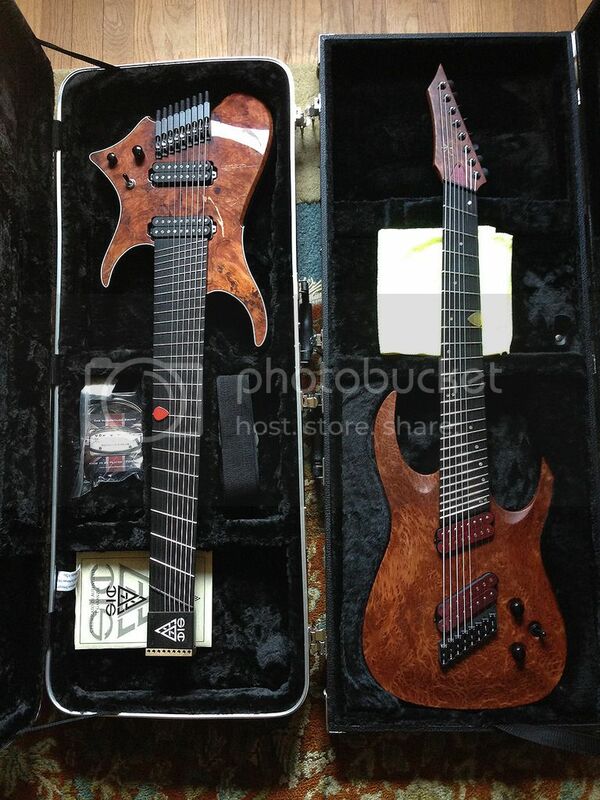 Since I saw that first redwood KxK they've earned a slot on the endless "gear I want to own someday" list. Dude this whole thing just works. 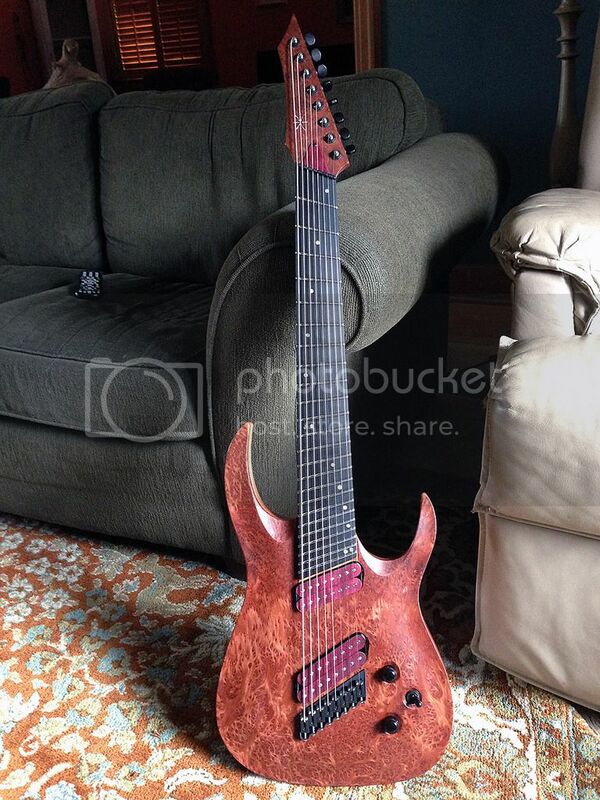 The top is insane, the bridge is dope, the headstock looks like a weapon. I love the whole thing. I have some mild KxK gas, what are the necks like on the 7s and 8s? Are they super thin front to back? Man, mine's currently the one getting built, and I can't wait! That is soooo nice! And I also remember a near identical build that someone had a year or two ago. I think the only difference was the wood on the bobbins. Great score! The NGD by the woods / beach, right? That's the one I'm thinking of! I totally thought this was the same guitar at first but I guess they were twins. Keep looking, because Rob used to do sunken TOMs back in the day, so they're bound to pop up every once in a while. I have two now but they're both Hipshot. IIRC his 7s were mostly TOMs, and the 8s have been Hipshot. 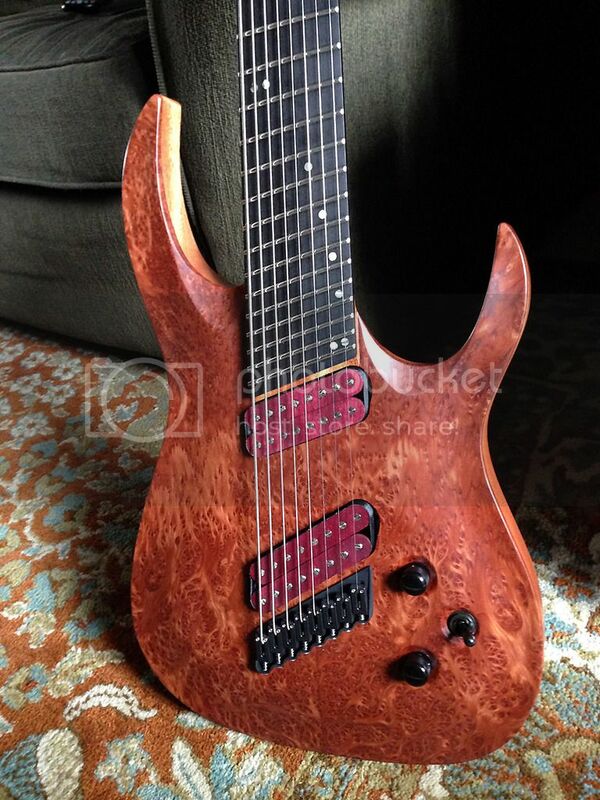 KxK's stock 7 string profile is a lot like the old UVs if you've ever played one of those. Pretty thin. Pretty sure there have only been 2 8s with Hipshots, the fanned guitars are custom bridges KxK makes. Glad to see these are still happening. I've been losing faith in my 7 scale order. Thanks fellas. So, the scale is 25.5 - 28" and I'd drive myself with specs so I was happy to grab an "extra". Rob's work is second to non. The fretboard and top are the same, mine has Mahogany and the other was Black Limba, so glad to hear the "rising sun" is coming up Holloway. The carpet - yea I get it but I let the wife handle those choices, did you see that top though? 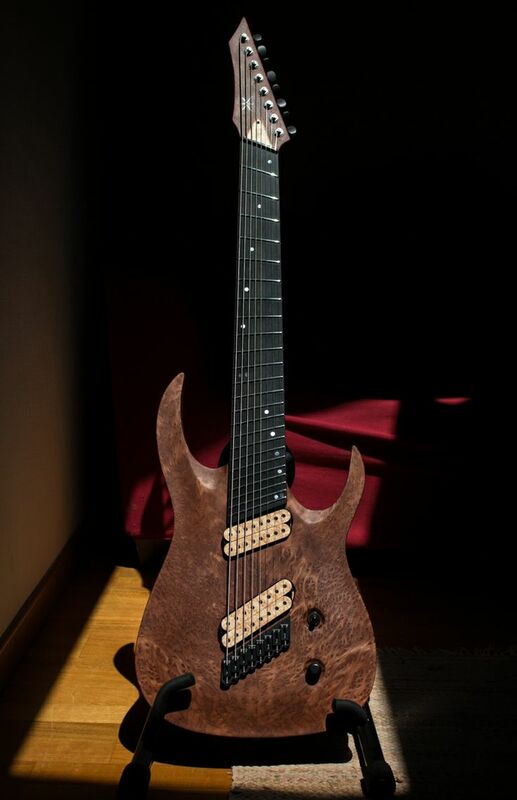 The pics are from my SiC NGD and it's a beast, love it. 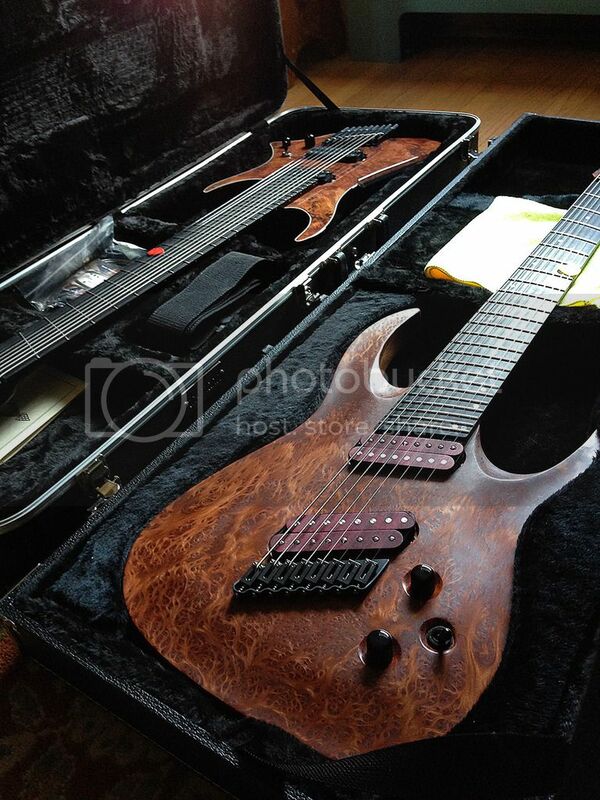 Also glad to hear those 7scales are still churning out. I've got an 8DC build going on too.